I wasn’t expecting a March snow storm on the evening I drove over to meet Mike & Annette Boswell. Their warm and welcoming home was a pleasant contrast to the cold and blowing snow outside. Mike is tall and friendly and his wife Annette is someone you feel you’ve known all your life. Annette is related to the Meaders family of White County and the story of generations of her family’s pottery making is a story for another time. I was instantly fascinated by the selection of handmade cigar box guitars that were lining the couch in the living room. Each guitar is different and many have stories to tell. 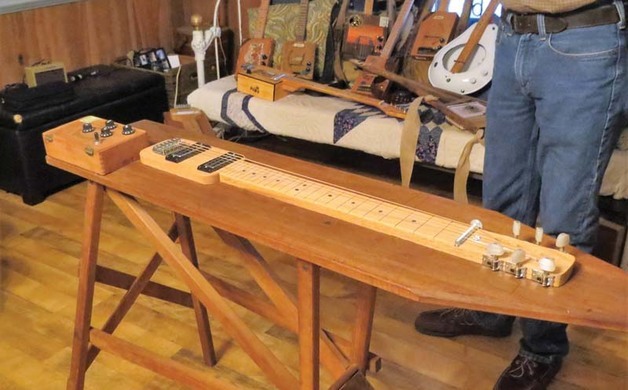 Mike does not claim to be a musician but he does know how to build a cigar box guitar. He started making these individualized guitars back in 2014 after he had seen some examples on Pinterest. Cigar boxes and boxes in general are something Mike likes to collect and he and Annette enjoy “yard sale-ing” together when they get the opportunity. Mike generously took the time to show me each guitar individually and to point out different materials he had used for each one. It would be hard to say which was my favorite but I definitely fell for the slide guitar mounted on an old ironing board. He even took the time to play a You Tube video for me, of their friend, playing Amazing Grace on this particular guitar. I had never heard Amazing Grace played quite like that and it was beautiful. I asked Mike about the history of cigar box guitars and he told me he had seen very old etchings with the guitars in them. They may have originated from the Mississippi delta where music was a way of life and an escape from the pain of poverty. Musicians would create a guitar from whatever they could find, a cigar box, broom handle and some wire could make a makeshift guitar. It would be hard to include every photo of every guitar that Mike had to show me. Each one was unique in its own way and they are for sale, starting at around $150. Mike puts an average of six hours into making each guitar and the only things he orders are the pegs and strings. The selection of guitars is wide and varied, from guitars made with mule hangs, to sling blades and hat molds, Mike’s ingenuity and creativity seems to have no limits. Twenty-two rifle shells for fret markers and nails for bridges, are some of the ideas that make Mike’s cigar box guitars so unique. 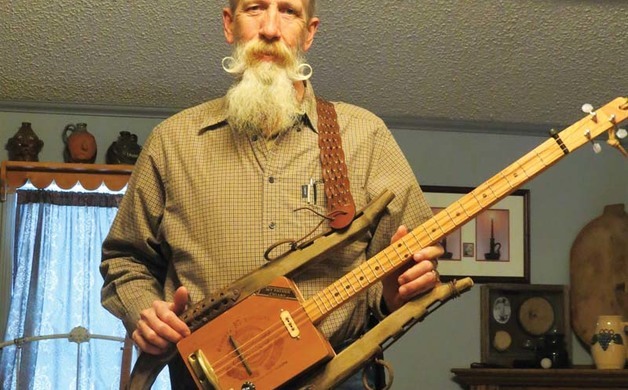 I was amazed at the guitars made from bed pans, especially when he plucked a few strings so I could hear the deeper sound of the notes coming from this most unusual instrument! Mike likes to call his art a Cigar Box Ministry. He and Annette shared with me that they have shared his guitars in outreach programs to help troubled youth. If you want more information or would like to buy a cigar box guitar you can call Mike Boswell at 706.878.9279.